Set up in Issy-les-Moulineaux within the Parisian region, Isséane incineration plant is often visited by French and foreign delegations. The plant has been operating since 2007 and is counted among the most recent and highest-capacity incinerators in France. SYCTOM – a waste treatment union covering Paris and 83 municipalities – pride themselves for building it. This plant administrated by Dalkia Wastenergy (ex-TIRU – a subsidiary of EDF) claims to be the shining star of the incineration industry as well as its role model. 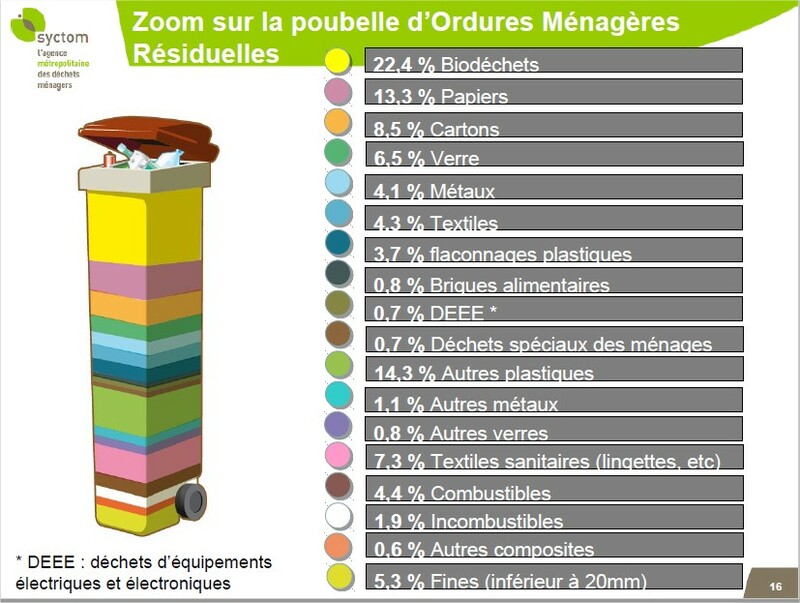 Zero Waste France would like to shed proper light on the main talking points and assertions made by SYCTOM. Yes: Isséane is not just another incineration plant as it also includes a waste sorting centre for selective collections, allowing it to be referred to as a « multi-stream centre ». But: the importance of the two distinct activities is far from equivalent. The incinerator has a capacity of 510 000 tons per year, whereas the waste sorting centre only handles… 23 000 tons per year. Although it is clear that two distinct installations are set up and that one of them is dedicated to sorting waste, the imbalance is obvious and reflects SYCTOM’s overall policy, massively oriented towards incineration. Yes: the plant fits into the dense urban architecture as its appearance does not clash with its surroundings, contrarily to older plants whose setting hardly mingles with the landscape. SYCTOM often claims that big companies such as Microsoft have recently built offices nearby. Better yet, the union regularly brandishes the price of the square meter in the plant’s area which gracefully exceeds 10 000€. But: the plant, whose a large part is established under ground, was built with the purpose of looking as estranged from a standard incinerator as possible. In particular, dry processing of waste gas prevents the formation of smoke plumes visible from outside the plant. Chimneys themselves were built in a manner that prevents neophytes from identifying them. The plant, far from blending in, is actually dissimulated ; as a consequence, most of the inhabitants do not gather that it is in fact a domestic waste incinerator. On top of that, should the price of the square meter really be considered to measure the acceptability of such a plant or its performance, in a region where the density of housing barely leaves businesses with a choice as to where they should set office? Invisible smoke = no pollution ? Yes: the plant does not produce smoke visible from outside. This is very likely due to the so called « dry » processing of atmospheric releases emitted by the incinerator which allows for a considerable economy of water, where « humid” processing generally uses water and produces a very visible smoke plume. But: we are often confronted with the fact that many people believe the absence of visible smoke is equivalent to no emissions or pollution. However, like any combustion industry, the plant of Issy-les-Moulineaux emits pollutants into the atmosphere. These pollutants are ruled by ministerial order, but abiding by the rules does not amount to absence of pollution. 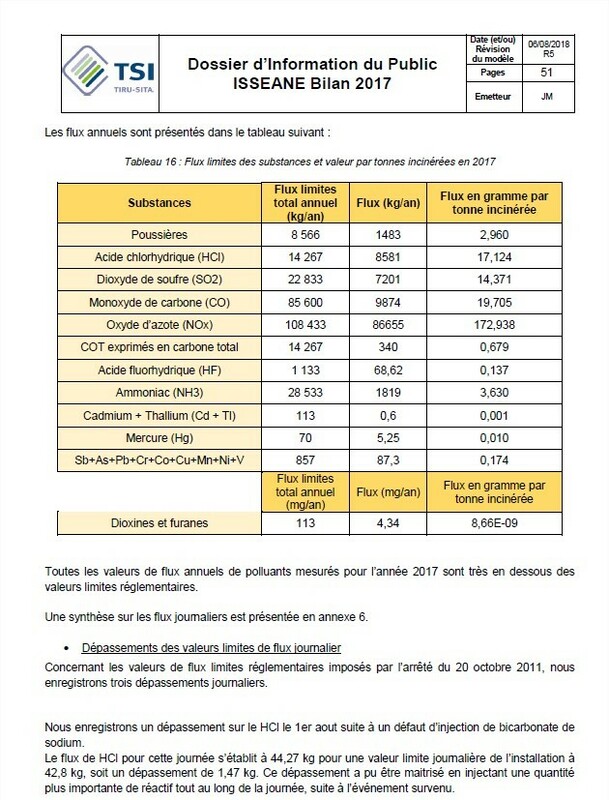 Below are the measured emissions of the plant for 2016 and 2017; the left column corresponds to the regulatory limit that cannot be exceeded, the middle column corresponds to the total of emitted pollutants in kg/year by the plant and the right column corresponds to the total stream of pollutants divided per ton of incinerated waste, in grams. Conclusions: Isséane clearly contributes to the ambient atmospheric pollution and the absence of visible smoke does not equate to absence of emissions. 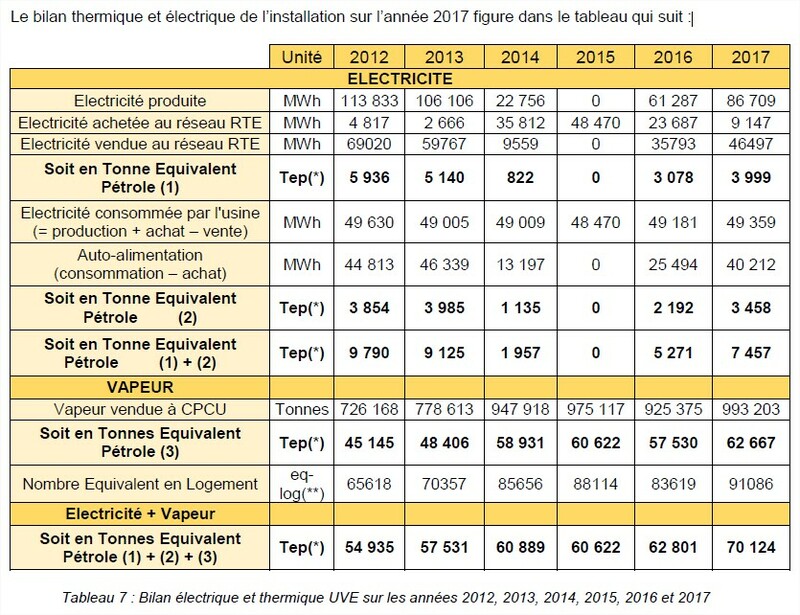 Yes: Isséane produces energy in the shape of electricity and warmth (covering 80 000 to 100 000 houses depending on the year) without interruption – aside from technical hitches. This assertion is the main talking point used by every incineration supporter in France. Some materials are also recovered from residual waste at the end of the combustion process, such as ferrous and non-ferrous metals. But: the production of energy by incinerators has become a key argument in justifying their construction and exploitation, in spite of other demands such as the preservation of resources. It has come to a point where some cities have become energetically dependent upon their heat network. Let’s not forget that incineration, which initial objective was waste management and not energy production, is destroying precious matters (organic, recyclable, etc.). Furthermore, the energetical performance of incinerators, as it has been measured so far, does not yet allow for the quantity of burnt waste’s “grey energy” to be estimated properly (as to the complete energy and carbon balance resulting from extraction of raw materials, the fabrication of objects, their transportation and use, etc.). 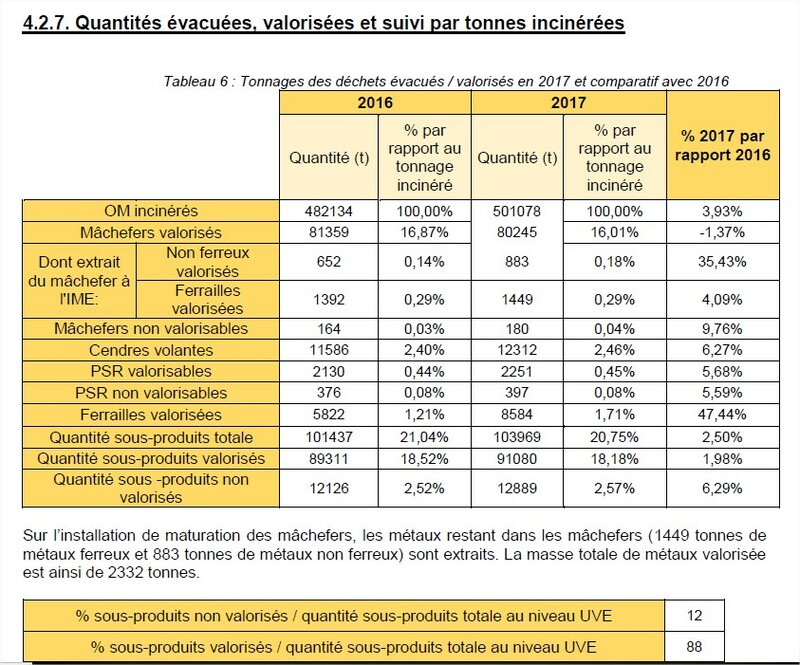 Finally, Isséane produces solid residual waste like any other incineration plant which remains to be treated at the end of the incineration process: in 2017, for this plant only, 80 000 tons of slag had been produced. Although highly loaded with pollutants, this type of material is subject to a very permissive legislation and generally ends up as road sublayer or on landfill if it finds no taker. The systematic landfilling of those material would in this sense strongly undermine the model (including financial balance) of incineration. What is more, 12 000 tons of hashes and solid residual waste were sent to landfill for hazardous waste that same year. 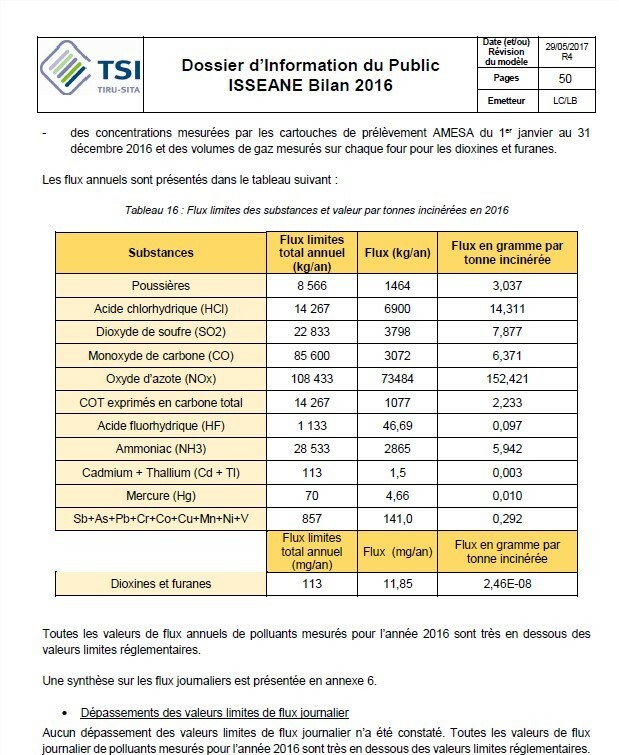 Isséane, the French reference in terms of waste management ? It should be noted that in 2017, SYCTOM processed 2 313 363 tons of waste. In total, 1 881 817 tons were sent to incineration and 147 943 tons were sent to landfill. The average recycling rate in the local territory revolves around 15% (we count 184 600 tons of processed selective collections in 2017). This rate should not be mistaken for « material recovery » – a terminology which endorses the use of slag as road sublayer and serves SYCTOM in communicating on their 30% figure while creating confusion with the actual recycling rate. Isséane – operating since 2007 – has cost the modest sum of 540 millions euros for its set up only. In addition, SYCTOM is preparing to rebuild the plant located in Ivry-sur-Seine. Although the plant’s estimated capacity has been narrowed down by half, from 700 000 to 350 000 tons of waste per year, its cost amounts to nearly 1 billion euro staggered over twenty years (building + operation). The third plant currently managed by SYCTOM is located in Saint-Ouen and processes around 540 000 tons of waste per year. According to SYCTOM’s numbers, we can find 42% of sortable waste among the incinerated residual waste (75% when including organic waste). In this context, a significant share of waste could be diverted from incineration by limiting waste through efficient consumption and better sorting, so that SYCTOM could hardly be regarded as a pioneer in the realm of minimisation of residual waste. Isséane appears first and foremost as a symbol of a massive and continuous investment policy oriented towards incineration, and clearly illustrates the permanent competition between incineration and reduction of waste.